Somehow your child gets into the medicine cabinet and ingests some children’s Benadryl. What’s going to happen to her? How do you find out? Should you take her to the ER? Call 911? Call her doctor? Wait and see? One of the fastest ways to find out what to do when your child has ingested something is by calling Poison Control, 1-800-222-1222. They are available 24 hours a day, 7 days a week, and even on holidays. 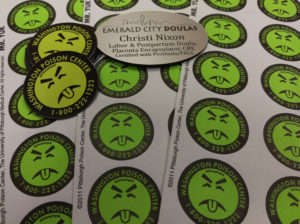 I recently went into a Poison Control office in Seattle to find out if they had any resources that I could share with my clients. I walked away with more than I sought. I walked away with information. Poison Control has doctors and pharmacists on staff that are able to help you determine if your child ingested medication or some other item that could harm them. They can help you decide whether to call 911, go to the ER, or wait and see. Not only do they know about medications and household items, Poison Control also has knowledge about wild mushrooms, berries, leaves, and other things in our environment. The very helpful staff I spoke with told me that often times they are called by ER staff, doctors, and pharmacists who need help determining if what was ingested was poisonous, or if the amount taken was a dangerous level. Another interesting fact that can be helpful to know if you are pregnant or nursing a baby: You can call Poison Control to determine if a medicine you want or need to take will cross over the placenta or cross into the breast milk and harm the baby. If you have been prescribed a medication and are worried about the medicine’s effect on the baby, call them anytime day or night, weekday or weekend, holiday or not. They are there to answer your questions.